At night, the ski resorts groom some of the ski runs (usually the cat walks), close them off for 1-2 hours to enable them to freeze, and then open the slopes for night-time sledding. 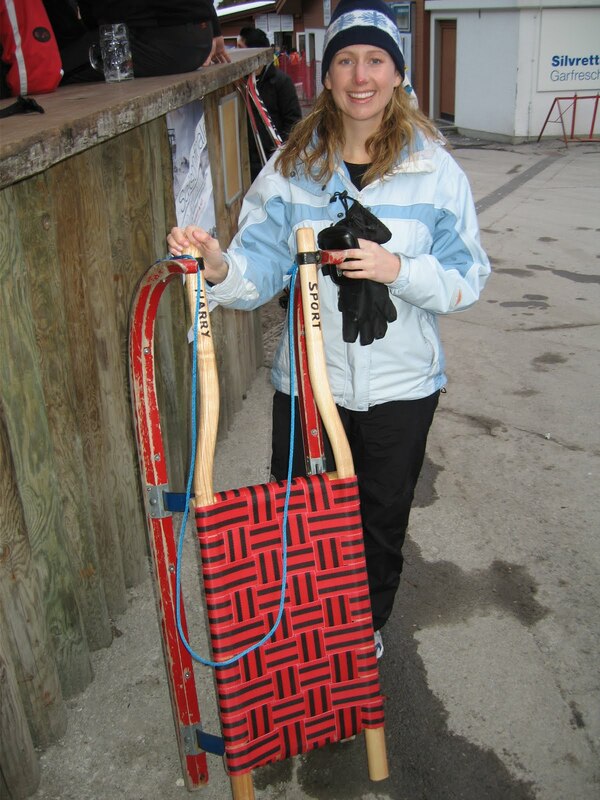 Instead of using safety-aproved plastic sleds, Europeans use the old fashioned sleds with metal bottoms (seen in the US in the 1950's) with minor improvements. This sleds are designed to go fast, and with a little wax, will go even faster. This makes for entertaining sledding as there are ony rudimentary steering mechanisms to control them (i.e. if you want to turn right, put your right foot out). 8:20pm - CRASH! (the friend in front of me wipes out on his sled, takes my sled out, takes out the 2 friends sharing a sled, and another friend) I skidded a good 10 ft. face-first in slush. There was definitely a need for a hair dryer and clothes dryer after this.